Amalfi Handmade Abstract Cream/ Gray Area Rug (9' X 12') - 8'10"x11'9"
Jazz Handmade Abstract Gray/ Silver Area Rug (9' X 12') - 8'10"x11'9"
Declan Handmade Abstract Cream/ Silver Area Rug (9' X 12') - 8'10"x11'9"
Ines Hand-Knotted Trellis Cream/ Brown Area Rug (9' X 12') - 8'10"x11'9"
This Nikki Chu hand-tufted area rug boasts a quintessentially modern abstract design, capturing intrigue with intersecting silver gray lines over a white backdrop. The wool and viscose blend of this accent creates an invitingly soft feel to this on-trend layer. 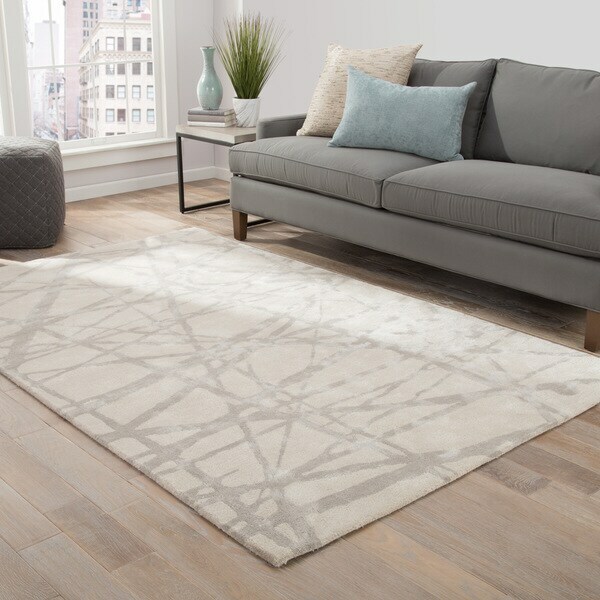 Stellan Handmade Geometric Gray/ Beige Area Rug (9' X 12') - 8'10"x11'9"